Habitually I felt I should make some statement as these things came out. The 'smart' announcement is not deserving of any serious examination. The government has long been foolish in the issues around smart. Having given little thought to raw data issues in an un-costed rollout, they now want an app for their iPhones - approaching MaRs'ians to do that makes sense as that institution is also advertised as smart - and hangs right outside of Queen's Park's walls. Contract more expensive supply and the total cost goes up - with the market rate going down resulting in the global adjustment going up. 2 years ago I was thinking about what the stakeholders will now be addressing for the purpose of developing the next set of stakeholder initiatives (the HOEP and GA initiatives were suggested by this panel report with I lampooned here). I suspect they aren't going to discuss any actual resolutions to any issues, but only the next theme of the next stakeholder consultation. Energy demand is forecast to decrease by 1.1% in 2013 after a small 0.5% increase in 2012. Factors such as growth in embedded generation capacity, which reduces bulk power system demand, and on-going conservation initiatives will more than offset any positive impacts from population growth and economic expansion, leading to an overall decline in electricity consumption at the bulk system level. The IESO is forecasting a decline in consumption because more 'embedded' generation will exist - which doesn't really match what most citizens would think of as consuming less. Embedded generation the IESO cannot control - and apparently they can't monitor it very well either as the public receives no figures on solar production in Ontario. It's notable that the Outlook does not contain a single reference to the Hourly Ontario Energy Price (HOEP), despite it requiring a stakeholder consultation. The Outlook does contain 3 references to the related 'Global Adjustment' - all in terms of it's ability to reduce peak hours - currently in the summer. This references the class A global adjustment mechanism - which I'll return to shortly. ...SBG conditions are expected to return in the spring and summer of 2013 at a frequency and magnitude comparable to 2012. These SBG conditions may need to be managed through control actions, such as increased exports, minimum hydro dispatches, reduced wind dispatches and nuclear maneuvers. It's somewhat surprising that with 1500MW of nuclear recently back online (for 2012 Q4) the expectation is for SBG to be similar to the performance in 2012. Perhaps the confidence comes from the lack of growth in SBG over the last quarter, which is noted at the very end of the outlook. That's a bad assumption because generation capacity, and Ontario demand, were similar in 2012's 3rd quarter and 2011's, whereas 1500MW of nuclear capacity is a substantial systemic difference. I reviewed the 'Contracted Generation Resources' table of the final Outlook of each of the past 4 years (table shown as endnote)and suggest the reason SBG didn't increase in 2012 is because generation didn't increase in 2012 (nearly 1000MW of coal capacity was pulled out of service late in 2011). In fact the review indicates that since the last Outlook that was released in 2009, 2900MW of coal capacity is gone. Approximately 47 MW of biomass, 1260MW of natural gas turbines, maybe 700MW of wind turbines, and about 550MW of solar (embedded),. had entered operation prior to the very recent 1500MW of nuclear. These figues show only about 1300MW of capacity has come online that has coal's "flexibility to help facilitate the management of maintenance outages, provide effective ramp capability, and even provide regulation when necessary" (from the Outlook), and over the next 18 months the Outlook sees only 100-400MW of capacity with coal's attributes due to come online (depending on your view of Atikokan). Attempting to replace coal with nuclear, solar and wind is going to impact the HOEP, Global Adjustment and SBG. The IESO states that the "Global Adjustment Allocation will have an effect on peak demands." This must reference the fact that Ontario's largest consumers of electricity have the ability to drastically lower their electricity bills by restricting usage in only 5 hours - the 5 highest daily usage hours. I've previously written on the Class A global adjustment noting that wind output is often absent during the 5 hours, and I've also written that must-take renewable generation is better perceived as negative load than positive generation. A look at the summer's prospective Class A hours demonstrates this is relevant - note that the HOEP make more sense in terms of demand when wind production is subtracted as opposed to simply relating higher demand to higher price. 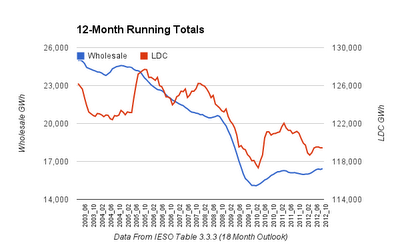 The IESO does show data for prior years, but they show it quite differently. AQEW means Allocated Quantity of Energy Withdrawn - what that means isn't well defined, but based on the data for prior years it may be Net Ontario Load" and "Embedded Energy." The IESO's "Ontario Demand" figure is actually IESO grid controlled generation plus imports less exports; it doesn't include any measurement of actual demand or consideration of embedded generation. All of the data seems to be less sensible because line loss is not shown anywhere - presumably it's essentially the difference between "Ontario Demand" - which we see - and "Net Ontario Load", which we do not see. Regardless, as embedded generation goes up, unreported, presumably the "net load" goes down. I treat wind and solar as embedded generation, and, in fact, most solar is that, and most new solar will be that. The IESO has noted by 2014, the period the Outlook forecasts into, over 2000MW of solar, and 700MW of wind, will exist that is not "grid connected." The increase in, particularly, solar capacity that is not grid connected can only lower "net load" demand on the IESO's grid during the summer peak hours, and that means the Class A rules will be increasingly irrelevant in reducing the need for IESO-grid supply capacity. The IESO's "base Ontario load" is the issue to address. A look at the 5 highest demand hours of the past winter (Dec-Feb) is instructive. Notably, the winter peaks are in the dark - so the additional 1500MW of solar generation won't act to lower winter's peak loads. The IESO notes that the Class A global adjustment will impact peak demand, but it won't - the addition of embedded solar will lower the peak load demands on the IESO controlled grid briefly; then the peak load that the IESO controlled grid will be required to meet will be on winter nights when solar is absent, wind may be unproductive, the Class A mechanism for setting rates is irrelevant and Ontario's Time-Of-Use pricing is dropping to off-peak rates to appease voters who like to be cooking dinner at the time. That this will occur over the next two years won't be seen as problematic, but as an opportunity for more "stakeholder consultations." One element of the IESO Forecast is a Resource Adequacy Assessment (I believe this is required by NERC). Table 4.1 of the the Forecast shows an installed capacity of 1511MW of wind having a "forecast capability at Winter Peak" of 507MW. One year ago they showed the figure as 518MW (on capacity of 1412MW), and it was 276MW. In fact winter's top 5 daily peak hours usually will usually have 1 hour where production is below 10% of capacity. While wind output is, on average, ~2.5 greater in the winter than in the summer, that only means the periods were it is producing at low capacity are less frequent - they still exist, so I'd suggest the capacity value is still closer to 0 than 30%. Of the 2174MW of generation the IESO forecast sees over the next 18 months (2/3rds of it in 2014), only 356MW will have a significant ability to reliably meet peak winter demand - and only 456MW an ability to reliably contribute to meeting peak summer demand. The ability/inability to retire Ontario's ~3300MW of remaining coal-fired generation capacity will not be significantly different in 18 month than it is today. Non-dispatchable supply, including much nuclear, some hydro, many non-utility generators, and industrial wind turbines, poses essentially the same issues as embedded generation. on a website or I have something to valuable to contribute to the conversation. I looked at. And on this post "2nd Anniversary: Current Initiatives, my past and the IESO's outlook". have 2 questions for you if it's okay. Is it only me or does it look like like some of these comments appear like they are coming from brain dead visitors? :-P And, if you are writing on additional social sites, I'd like to keep up with anything fresh you have to post. Would you make a list all of all your social sites like your linkedin profile, Facebook page or twitter feed? make a top notch article… but what can I say… I procrastinate a whole lot and don't manage to get nearly anything done. Hi everyone, it's my first go to see at this website, and post is actually fruitful in support of me, keep up posting such posts.